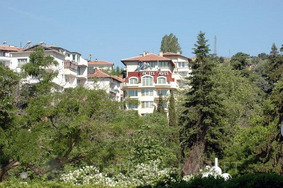 Avis Hotel in Sandanski Spa Resort in Bulgaria. Reservations and bookings. Location: Avis hotel is situated in the park area of the town of Sandanski, near Interhotel Sandanski and Sandanska Bistritsa River. Accommodation: The hotel offers 12 double rooms, 2 apartments, restaurant, winter garden and a roof terrace with a panoramic view of the town. Every room has an air conditioner, cable TV, wireless Internet access, telephone and minibar. Wine & Dine: The stylish restaurant offers local specialities prepared from authentic old recipes, rich choice of alcohol and soft drinks. Facilities: Avis Hotel offers to its guests fitness and conference room as well.